I worked with a guitarist who played an Esquire and a brown face Concert Amp. He painted this beautiful screaming amp black. He had a great sound with that old Esquire rear pick up and the non-reverb 4×10″ Concert. This was in 1972 so I didn’t know anything about the value of his guitar & amp. Pure Fender! tHOSE WERE THE DAYS. Skip “Alex” Spence, our lead player played through an amp custom built for him. The tech for Moby Grape put together (4) Twin Reverb amps into one monster amp. This pushed (4) 4×12″ custom built speaker bottoms. Yea, the Concert paired with that Esquire is the same set up that we hear on the first Steppenwolf album. Yea, the entire album I understand was recorded with this set up. Born to be Wild, Jupiter’s child, The Pusher, yep! Great tone I would say…and a winning hand…..Its the tone I chased for years. Finely got this set up, and bingo! I was digging through my grand fathers attic and came across this amp staring back at me. He bought it new back in 1960, played for a month or so and locked it away. It is is PERFECT condition. Along with the amp he bought a Buddy Holly edition fender strat, which a frind so lovingly took off him for a few hundred bucks (FML). Anyway I took the amp home and in the process of having the speakers re-conned. I am super excited to hear how this baby sounds! Just picked up a Concert (6G12-A) last night for $600. It’s pretty beat up and the output transformer has been replaced with what looks like maybe a Super OT. Still sounds phenomenal. Needs some work, though. I’ll crack it open this weekend, but I’m almost sure it needs to be recapped. I’ll probably need to recone the speakers at some point as well. Incredible deal, though. It just sounds like gold, even in rough shape. No telling how amazing it’ll sound after being tuned up. Pdyckman, I played with Skip in ’72 as well, right after I moved to California, and I remember that amp. The “tech for Moby Grape” you mention was Howard Dumble, now known as Alexander Dumble. IIRC those amp[s were actually 4 4×10 Bassman circuits in one chassis, with some of the famous Dumble magic applied. Shortly after that the amp was stolen and as far as I know never recovered. I’ve always wondered what happened to it. While in school I worked for a repair shop in North Hollywood for a couple of years, in the early 70’s, at a place called Valley Sound. I remember a beautiful brown Concert came in that I was asked to replace the speakers with new JBL’s. I was amazed because it was a heavy amp to begin with, and now it was even heavier! It belonged to Kent Henry (an amazing guitarist) who had just joined Steppenwolf. We did all their gear. Good times! the later brown Concerts with 6 preamp tubes. Frankly, I don’t care a toss about the tremelo–who needs it? It’s the pure unadulterated tone that impresses me. I use different Fenders from different eras–tweed, brown, blackface–all are great, but when it comes to tone, none can touch the Concert. It sounds similar to the 1959 Bassman, but with more depth/bottom & headroom. It stands to reason they sound similar, considering the earlier 1960 Concerts and the 1959 Bassmans share the same “45249” output transformer. The earlier Concerts also have the same speakers as the ’59 Bassman: Jensen p10q’s & p10r’s. On my Concert, I use 1960 p10q’s on the bottom and 1959 p10r’s on the top. Fortunately, my Concert still has it’s orinal yellow tone capacitors–something else it has in common with the ’59 Bassman. But unlike the ’59 Bassman, the Concert has a solid state drive recitifier. That works better for me, perhaps because I’m going for more of a rock sound. 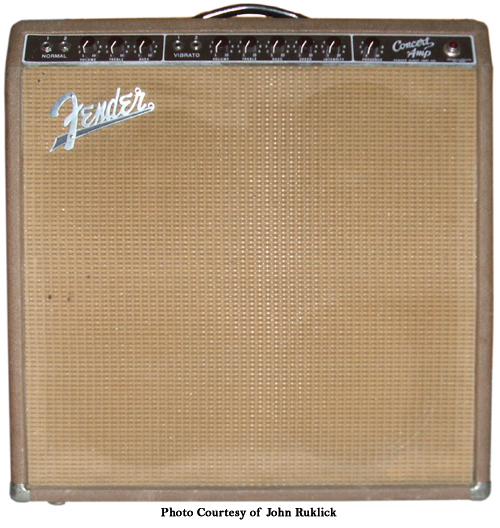 The Concert also lacks the “floating” speaker baffleboard that tweed Bassmans enjoy, but somehow the Concert’s tone doesn’t suffer–maybe because brown Fender combos use plywood baffleboards, not the tone robbing particleboard baffleboards found in the blackface Fender combos. Of course, some seemingly identical amps just sound better or worse for mysterious reasons. In any case, if you are fortunate enough to come across an early brown Concert, grab it! Were`nt the center volume concerts the same one as the early 1960 models made in 1959 ?? Does either one you owned have the pulse cap on the back panel ? I happened upon a very early 1960 Concert a few years ago (January 1960). Center Volume, 5G12. Jensen P10Rs dated from late ’59. And also has the “45249” output transformer. Of course it sounds spectacular. But I only use it at home. It’s way too heavy for me to take out to gigs. The concert also came in black tolex.